The cabinet agreed to scrap all the day’s business to allow a vote on Syria and agreed to a 12-point motion incorporating the main points of a motion passed in September paving the way for the Royal Air Force to extend airstrikes against Islamic State targets from Iraq to Syria. 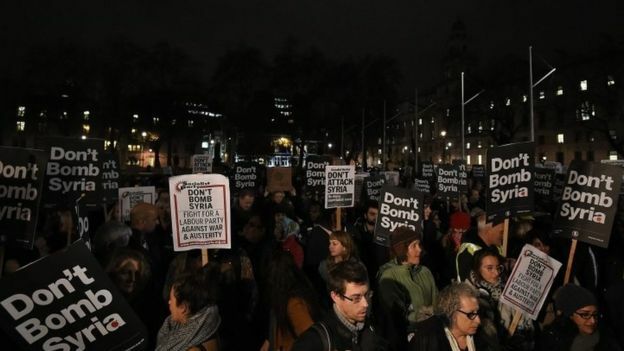 The entire process is described as absolute chaos within the cabinet as MPs are crying and jittery about the vitriol and bullying lobbied at them by anti-war demonstrators, pro-airstrike members, frontbenchers, backbenchers and shadow cabinets. The government motion would authorize air strikes exclusively against IS in Syria only and will not authorize deploying ground troops. Cameron warned that if Tory MPs voted against the air strikes they risk undermining a strong message the UK is standing alongside its allies including France and the US – already engaged in military action. Some estimates indicate that at least 360 MPs are likely to vote in favor of air strikes while 170 are against. Wednesday’s entire parliamentary schedule will be cleared for continued debate.